Bird of prey killing widespread across Northern Ireland – Birds of prey victims of 11 incidents of wildlife crime recorded in two years. 57 birds of prey were confirmed victims of reckless or intentional criminal activity in Northern Ireland during the last eight years. The latest report detailing the illegal killing of Northern Ireland’s native birds of prey has been published by the Partnership for Action against Wildlife Crime (PAW NI) and is available www.wildlifecrimeni.org. It reveals that there were five confirmed illegal poisoning or persecution incidents in 2015 and a further six in 2016, involving the killing of 12 protected birds of prey in Northern Ireland during this period. Killing six buzzards, five peregrines and one sparrowhawk. In 2015/2016 three of the incidents involved the use of the pesticide Carbofuran, which has been banned across the EU since 2001. This poison is illegal to use cross Europe due to its high toxicity to wildlife and humans. Further birds were killed using other banned pesticides, restricted-use rodenticides and the remainder were illegally shot. There were 49 cases of suspected wildlife crime involving birds of prey reported to the PSNI in 2015 & 2016, some of the birds were shown to have died naturally (e.g. 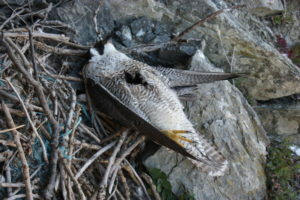 disease, starvation/ collision) and many of the birds were too decomposed for accurate testing. Twenty birds tested positive for the consumption of rat poisons, a reminder to landowners to use rodenticides in a responsible manner to minimise the likelihood of exposure to non-target wildlife and pets. Users must always read and adhere to the label instructions of the rodenticide, and they should collect and correctly dispose of any rodent carcasses daily. The report examines the occurrence and trends in confirmed persecution incidents of these birds, which has allowed PAW to produce ‘hot-spot’ maps to identify areas where crimes against birds of prey are occurring. Of the 11 confirmed cases in 2015 & 2016, five occurred in County Antrim, two in Counties Down and Armagh and one in each of counties Londonderry and Tyrone. The report shows that, since 2009, the most frequent casualties have been buzzards, peregrine falcons, and the recently re-introduced red kite. Red kites and buzzards are particularly susceptible to poisoned baits as they will scavenge on carrion routinely. Eimear Rooney added that, “where members of the public come across a dead or injured bird of prey and there is no obvious innocent explanation for its injuries, such as contact with power lines or windows, and a crime is suspected then they should call the PSNI on Tel: 101. If the bird(s) are found close to a suspicious bait, keep people, pets and livestock away until the police arrive. This report only covers the carcasses that are recovered and it is likely the ‘tip of the iceberg’, as these incidents tend to occur in remote locations. Therefore keep your eyes open in the countryside and remember timely reporting is important”. • PRESS POINT OF CONTACT: please contact Dr Eimear Rooney; raptorofficerni@gmail.com; 07743068931. 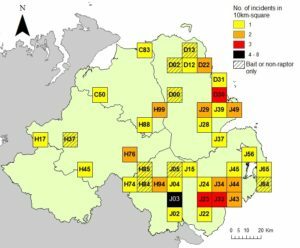 3 comments to Bird of prey killing widespread across Northern Ireland – Birds of prey victims of 11 incidents of wildlife crime recorded in two years. peregrines are in most of our cities now when they breed on a building there young go looking for a building with a man made nestbox on it peregrines are now imprinted to these boxes we have 60 cities in the uk and around 40.000 towns anyone can get a license to put a man made nestbox on a building for peregrines.it will not be long before very city and town will have peregrines.they can’t breed with out these man made boxes man is interfering the have changed the nature of the peregrine. Editor’s Comment. Carole no one requires a license to instal a peregrine nest box on a building. The only approval required is from the property owner. A license would be required to approach the nest,once the birds had commenced breeding. CAROLE…Gamekeepers have made it impossible for Peregrines to breed in quarry’s and Moorland due to poisons,traps and guns…hence… cities and towns have become their sanctuary..AND WHY NOT?